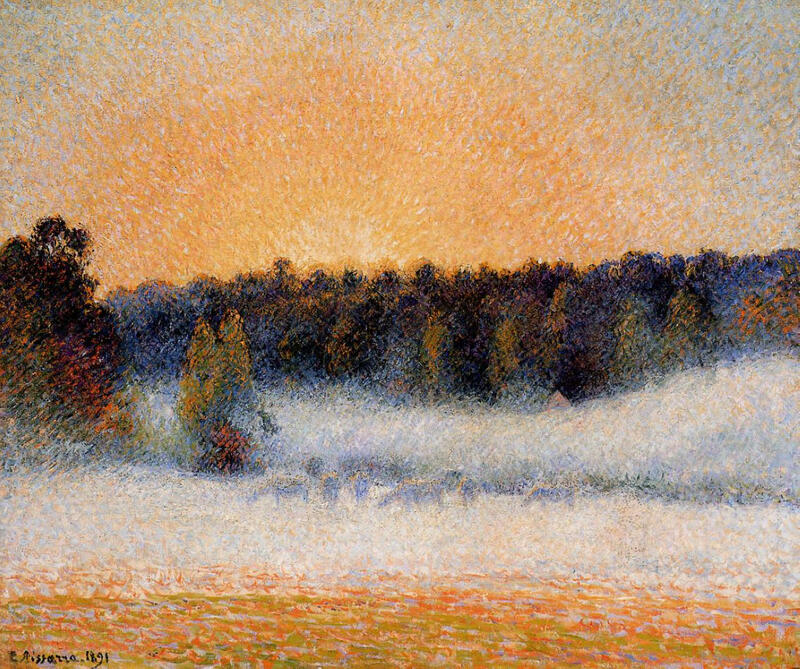 A simply golden landscape at sunset, by the central figure in Impressionism and father of Post-Impressionism. Sunset behind the edge of a wood. The field in the foreground is lit golden orange, but towards the back of it a thin bank of dense fog partly obscures half a dozen cattle grazing it. Behind them the fog clears sufficient to show the foot of the trees. They stand high above and behind the fog, highlights painted by the rich sunlight. Just to the right of centre is the gable of a building, set into the trees. At the left edge of the painting are nearer trees, with an outlier standing shorter, out towards the centre. The fog bank penetrates the gap behind those nearer trees at the left, in front of the main wood. The sky is brilliant fiery gold at the centre, fading outwards and upwards towards pale blue. The whole painting is composed of small, angled brush strokes, giving it rich and variegated textures. Pissarro’s signature is at the bottom left, with the year. 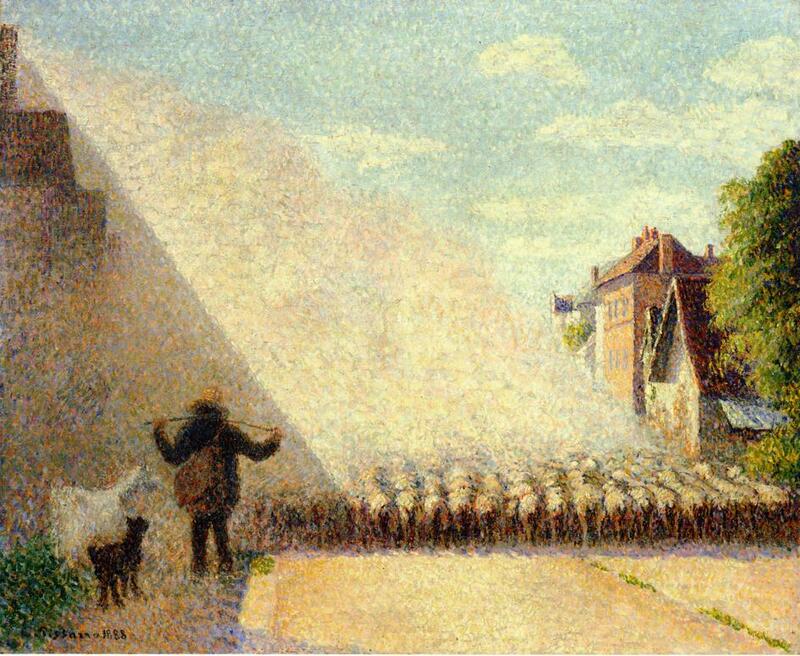 Camille Pissarro was born on 10 July 1830, on the then Danish island of Saint Thomas, in the West Indies, although his father was French, of Portugese Jewish origins. Educated near Paris, he returned to St Thomas to work in the family business, but when he was 21 travelled to Venezuela as a full-time painter, moving on to Paris in 1855, as studio assistant to Anton Melbye. Much impressed by the work of Courbet and Delacroix, and inspired by the landscapes of Daubigny and Corot, he tried the École des Beaux-Arts and Académie Suisse before being taught by Corot (whose links went back to Valenciennes, one of the early plein air painters). He had his first painting accepted by the Salon in 1859, when he also met those later to be dubbed Impressionists. 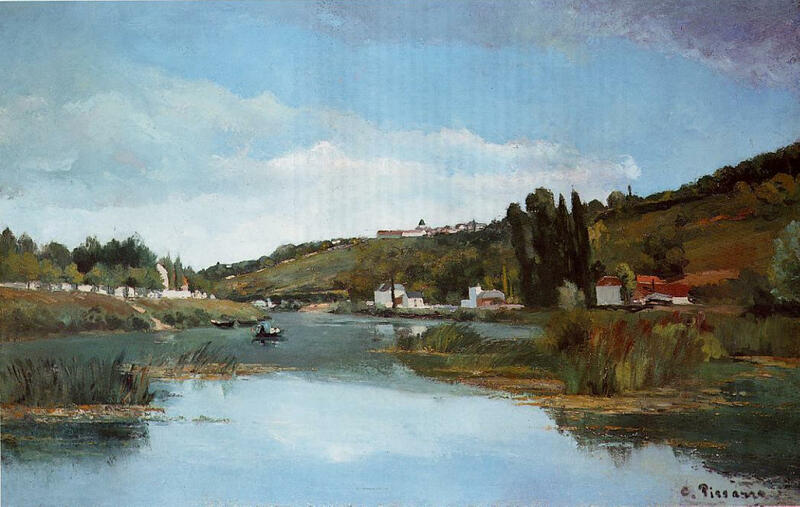 He gradually established a reputation for himself as a landscape painter in the tradition of Daubigny and Corot, and unlike other Impressionists his paintings were accepted for hanging in several Salons. He preferred working plein air as much as possible, developing speed and skill to enable him to complete paintings in front of the motif, rather than later in the studio. During the Franco-Prussian War of 1870-1 he fled with his family to Norwood, then a village outside London, and with Monet studied the works of Constable and Turner. He returned to England to paint in 1890, 1892, and 1897, when his subjects included Kew Gardens and Chiswick. Sadly the great majority of Pissarro’s 1500 earlier works were destroyed during the Franco-Prussian War, and the 40 or so that remained form scant documentation of the earliest Impressionist style. In 1871, he married his mother’s maid in Croydon, Surrey. On their return to France later that year they settled back into the first of a series of households on the outskirts of Paris, where he painted the landscape and its occupants daily. In 1873 he drew up the charter for the Impressionist group, and exhibited at every one of the Impressionist Exhibitions from 1874 to 1886, the only artist to do so. Over that period he maintained friendship and professional dialogue with all the others in the group, and helped Cézanne and Gauguin develop their techniques and styles. Camille Pissarro, Flock of Sheep (1888), oil on canvas, 46 x 55.2 cm, Private collection. WikiArt. In 1885 he befriended Seurat and Signac, and spent the next four years developing a ‘divisionist’ style with coloured patches rather than his previous fine brushstrokes. Although this period left permanent influence on his painting, he abandoned this ‘pointillist’ method because it proved too laborious and constrictive. 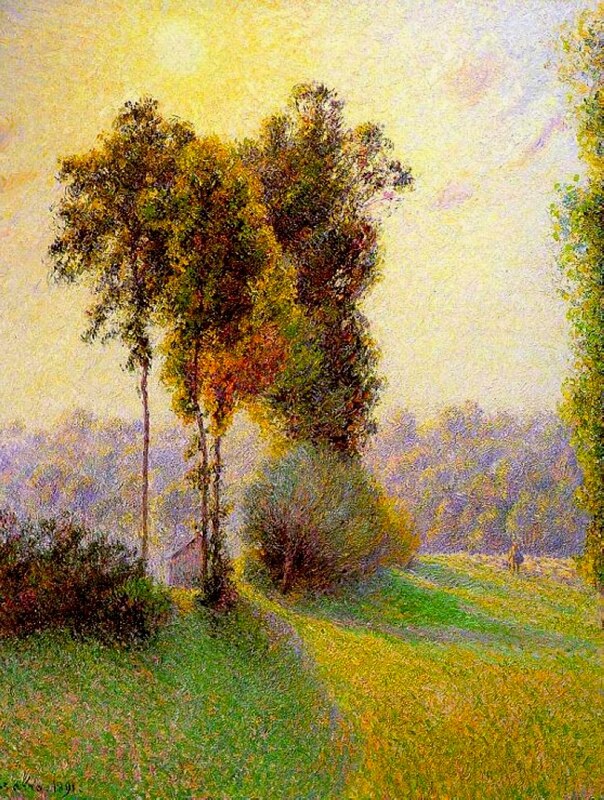 This period also saw a distinct cooling in his friendship with Monet, and he was initially scathing of Monet’s series paintings, particularly the Grainstacks of 1890-1. 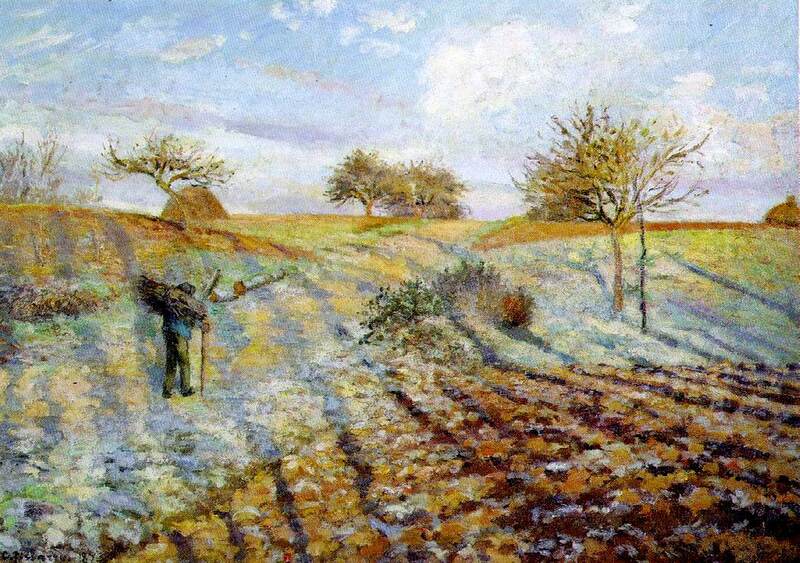 However when he returned to making brush strokes, Pissarro realised the virtues of such series. He was to paint extensive series for the rest of his life, including the largest of any Impressionist, over 300 paintings of Bazincourt, just 15 minutes walk from his home at Éragny, outside Paris. He suffered from chronic problems with his eyes which as he grew older kept him indoors when it was cold, so many of his later series were cityscapes observed through the window. He died on 13 November 1903. Although today Monet is most strongly associated with the Impressionist movement, and Manet with its origins, it was the modest mind and art of Pissarro which was actually its central influence. He brought with him the long and rich legacy of plein air painting which had flowered into the Barbizon School, including the great landscape painters Daubigny and Corot. But he quickly developed his own unique style, which he continued to develop during his work alongside Cézanne, and with the Neo-Impressionists. Camille Pissarro, The Pond at Montfoucault (1875), oil on canvas, 92.7 x 73.6 cm, Barber Institute of Fine Arts, Birmingham. WikiArt. An Anarchist, he also drew on Millet’s social realism in his figures. His early landscapes often contain figures in the distance, those going about their everyday business in the countryside which he so delighted in painting. By the middle of his career, the figures had grown to dominate many of his paintings, and he also painted larger gatherings including markets and fairs. However his figures, foreground or background, are not grubby, emaciated or weary; they are clean, healthy, and productive in the idealised countryside of his political dreams. Camille Pissarro, The Gleaners (1889), oil on canvas, 81 x 65.5 cm, Kunstmuseum, Basel. WikiArt. Through his work, we can see the major developments of Impressionism: loosening up and transition away from a smooth finished paint surface, visibility of brush strokes as mark-making, working plein air in front of the motif, depiction of real life with factories, trains, and ordinary people, the appearance of spontaneity, a shift away from chiaroscuro to paintings exploring the effects of light and colour, and depiction of the artist’s sensations. These are a culmination of many of the developments that I have focussed on in earlier articles in this series, and Pissarro was the central figure in their coincidence. 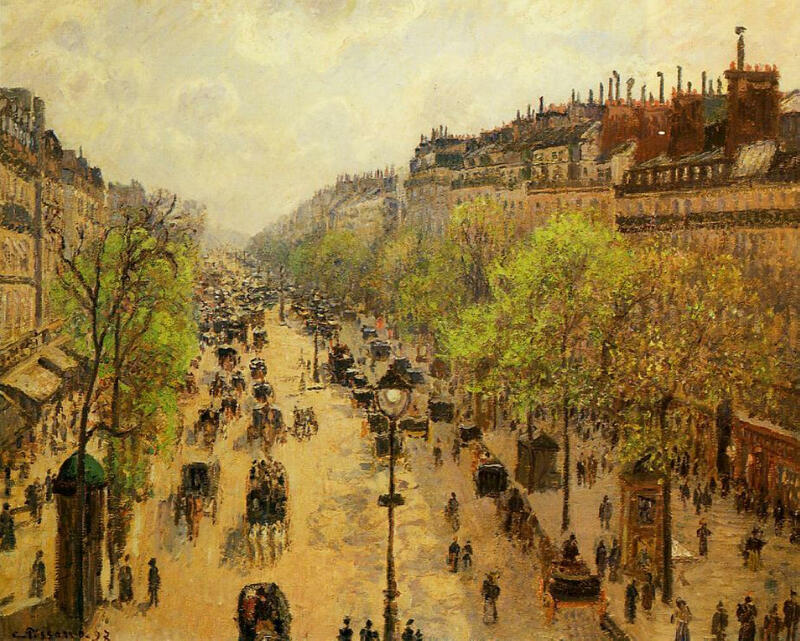 Pissarro’s weakness was in his modesty and lack of self-promotion. When Impressionist paintings started to sell at last, Monet’s invariably sold for many times the price of Pissarro’s. As the history of Impressionism has been shaped by fame and auction prices rather than artistic merit or historic importance, Pissarro has been relegated to the background, as if he quietly knocked off a few landscapes, and little else. By the 1880s the Impressionist movement was in danger of becoming a spent force, its key members reaching the limits of its agenda. Monet started to enjoy commercial success, and was perhaps more content to develop that and his personal exploration of light and colour. 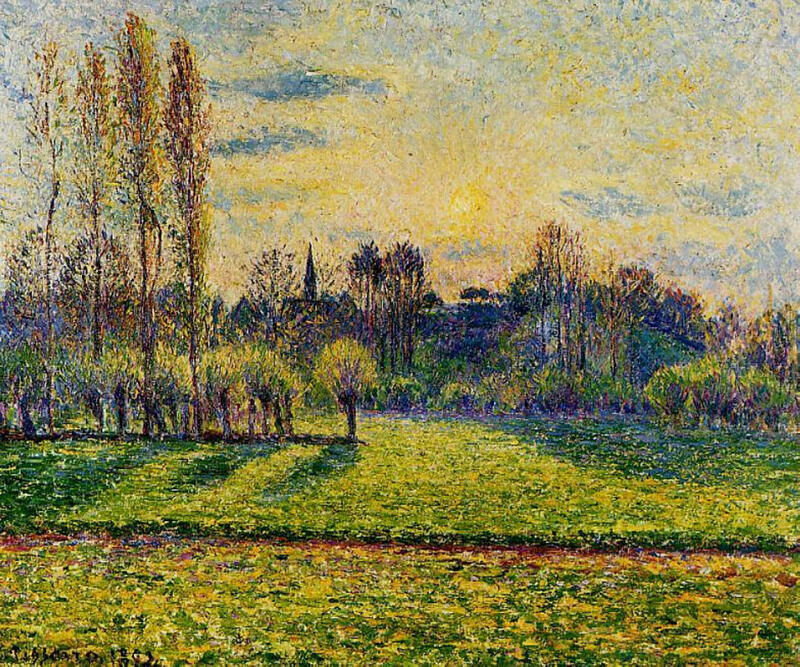 For Pissarro, the attraction of a fresh start, based on Ogden Rood’s technical approach to colour, was too good to miss. 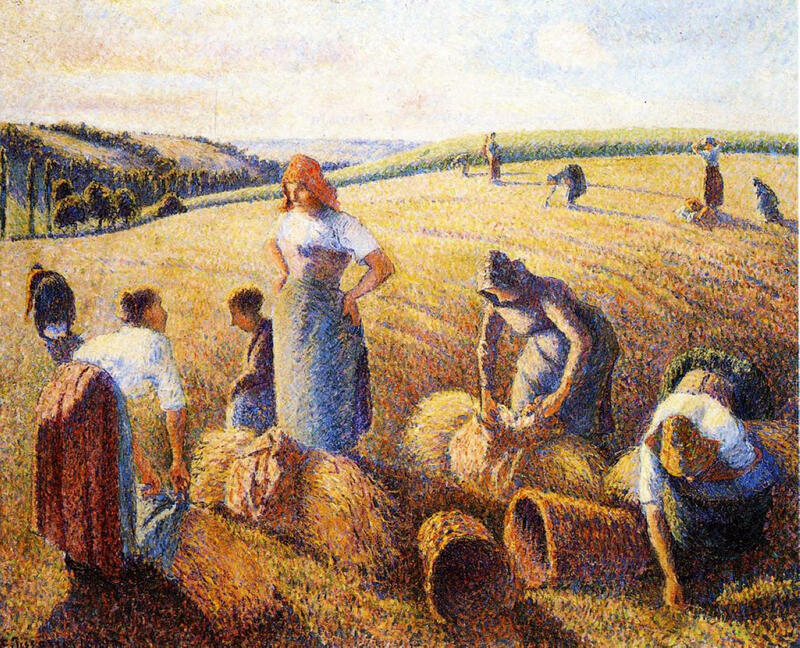 Pissarro’s involvement with the Neo-Impressionist experiment brought new light and colour into his painting, which he retained when he returned to his larger and less mechanical brush strokes, as shown in this Favourite Painting. This enabled him to resort to his ferocious productivity, and to develop Monet’s idea of series paintings. As his eyes and health forced him to look more on the outside world from his window, he painted series in the urban landscapes of Paris, Rouen, Dieppe, and Le Havre. None could compete in scale, though, with his extraordinary series of Bazincourt. Through his relationships with Cézanne, Gauguin, and Signac, his influence over Vincent van Gogh, and late friendship with Matisse and other young artists, Pissarro was not only the hub of Impressionism, but of singular importance to post-Impressionist art, and that of the twentieth century. 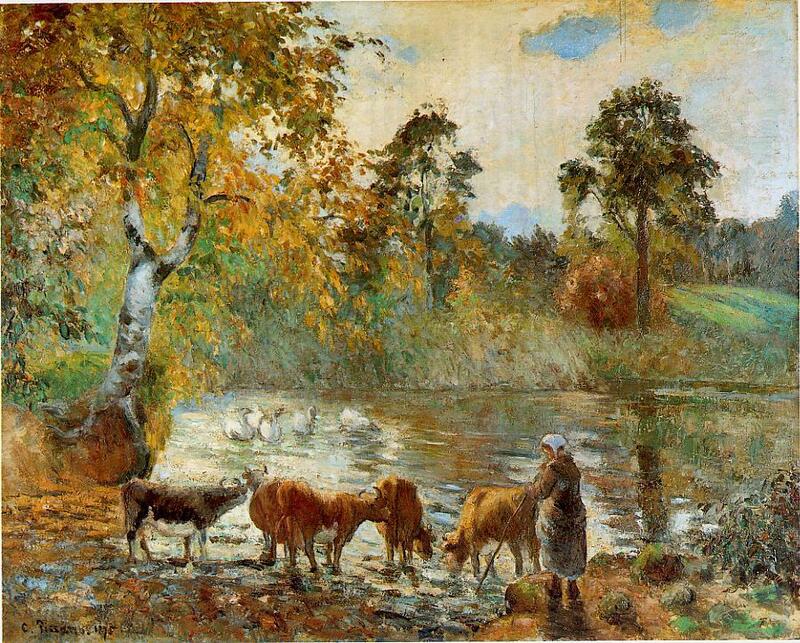 Pissarro is not in fashion at present, and there are consequently few sources of further information. Posted in Painting and tagged Cézanne, Corot, Daubigny, Gauguin, Impressionism, Millet, Monet, Neo-Impressionism, painting, Pissarro, plein air, Post-impressionism, series. Bookmark the permalink. I have just added another reference, Rothkopf, which I have just extracted from my book stacks. I have updated this further, adding the first two references, Brettell and Brettell – Pissarro, which are well worth obtaining secondhand.